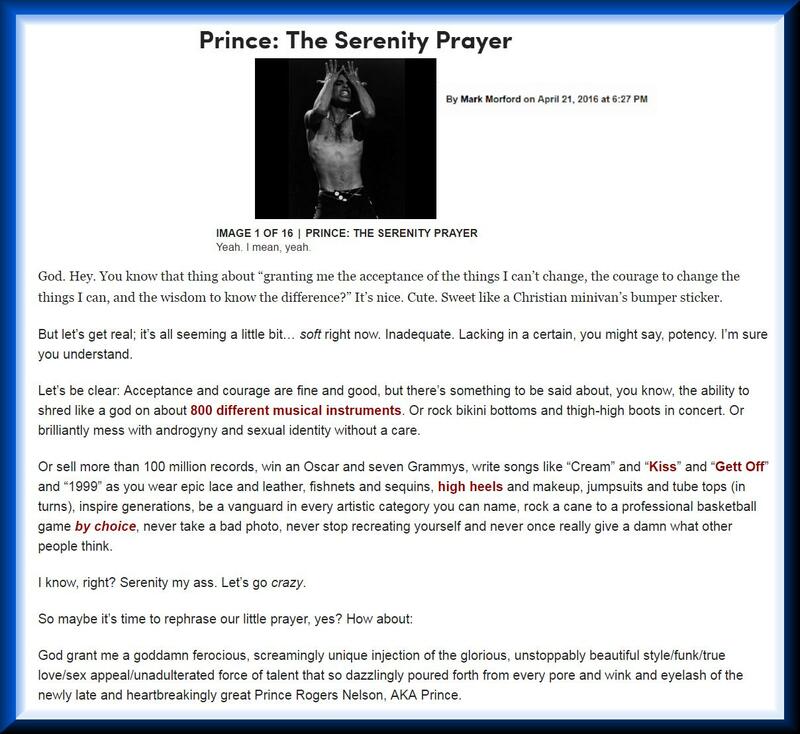 The Very Best 'Prince' EULOGY EVER... A MUST READ! Did you ever read something and scream out (to yourself) THATS IT! THATS EXACTLY HOW I FEEL! yet, when you try to convey this feeling using vocabulary, to others your brain waves go in all directions and you start sounding like an imbecile who cannot put two words together in order to make a coherent sentence. Reading Mark Morfords, magnificent attempt to eulogize the genius of Prince, is exactly this type of BINGO, a winner. If I had one wish it would be, award me the talent to write words that others will say, you communicate exactly the emotions I have about dwelling in this crazy existence as an animal with too much intelligence and not enough comprehension. But, I dont possess or even come near that kind of talent and neither do most clergy, psychologists, politicians, world leaders et al. who try to claim omnipotence through trickery and brutal force. Therefore, I will continue to celebrate those rare individuals (when I have the fortunate luck to come upon one of their writings) who can communicate in this manner. Thanks Mark Morford, you made my day! Prince Eulogy Excerpt: I think its an appropriate sentiment, yes? One we can all share in these cruel and trying times? Im sure you agree. Look, Im not trying to be greedy. Im not  not in this particular column, anyway  asking to be granted, say, any of the impeccable ethereality/lithe genius of the late David Bowie, AKA He who set the standard for creative self-expression as yet unmatched in modern popular culture. The man even made his own death an expression of his art. I mean, come on. Nor am I requesting, as of yet, any of the wise graciousness of the late Oliver Sacks, or the rib-cracking brilliance of Robin Williams, or the sweet blue tones of BB King, or the sly insights of Garry Shandling. Innovators, groundbreakers, icons and creative masters, all. Im certainly in no need whatsoever of the nasty, callous gobbledygook of Antonin Scalia; such pompous intellectual bigotry does nothing to help us gather here today 2 get through this thing called life. Verily, my request at this particular moment is simple enough: God grant me an enormous, glittering syringe of Prince-grade creative fearlessness and/or fearless creativity, slammed straight into my quivering soul like Travolta slamming adrenaline into Uma Thurman in Pulp Fiction. Twice. Grant me this gift, oh lord, and I shall forevermore kneel before the Princely altars of shrugging off critics, becoming arguably the best live performer in pop history, utterly destroying the Super Bowl halftime show, freely mixing musical genres (and making up a few new ones), fighting for intellectual property (and winning), destroying stereotypes and defying every norm and upending every status quo, all whilst championing girls named Nikki masturbating with magazines in various hotel lobbies. A Prince Walk-Away From Existence.